R5-D4 originally came with a yellow straight-latch firing button on the bottom of the body. This was replaced with an L-shaped button, which prevented the button from being pushed too far into the body. Comments: Pull droid halves apart to reveal launcher. Load the projectile into launcher, then press button to fire. 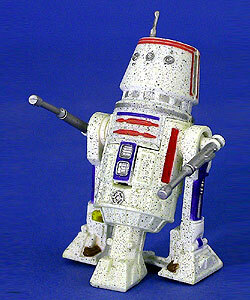 This figure of R5-D4 was originally planned to be an "Attack R2-D2" figure, but was changed to this droid instead. R5-D4's bad motivator is the result of conflicting stories. Some tales claim R2-D2 sabotaged the droid, others claim that R5-D4 intentionally blew his own motivator, and another tale claims that R5-D4 is actualy a Jedi named "Skippy."